Here at Vapourmate we want to make the whole purchasing process as quick, hassle free and secure as possible. That's why we insist on using PayPal Hosted Solutions as our secure checkout procedure. You can choose to pay by Visa, MasterCard, Delta, Switch, Solo, Maestro, Visa Electron or via your PayPal account if you have one. 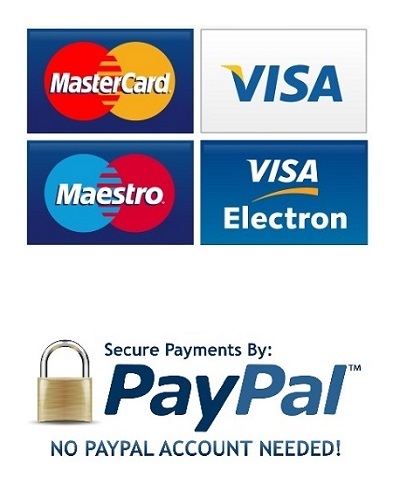 You can choose to pay via one of two checkout options, PayPal account or Credit Card. It really is as easy as that. Vapourmate is fully PCI (Payment Card Industry and DSS-Data Security Standards) compliant), so you can be sure your details remain yours. Your payment information remains securely encrypted at all times. We do not store your card details and furthermore, they cannot be accessed by us or by third parties. Vapourmate completes precise and exacting anti-fraud verification on every order and incorporate address (AVS) and card verification (CVV2) checks whilst utilising 128-bit encryption.